So glad to hear from you Chooky. 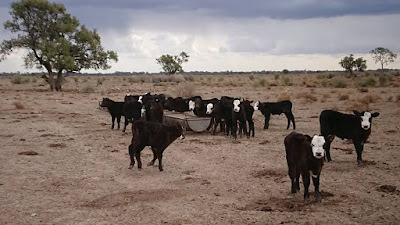 When the word drought is mentioned I always remember the last time you were suffering very badly - I think it was when you had those people from overseas staying with you? I know you came out the other side of that - in tact, albeit briefly. Wishing you all the best. All our thoughts are with those on the land. Thinking of you. You'll get through it. You are such a strong woman. Not sure I could handle all that with so much grace and perseverance. And here we are with localized flooding, and more to come with Hurricane Florence. Keep on keeping on! So many of us feel the same way...hang in there because that is what I am doing right now. Thinking of you and hoping that things turnaround soon. Happy to hear you are hanging in there despite these enormous struggles. My neighbor had friends visiting last week from Adelaide and we talked at length about the struggles farmers have when there is no rain. She said she felt guilty going to the beach when there were so many people in Australia needing water. Always thinking of you and sending you light and love. Thank you for posting. I have been thinking of you quite often and wondering how you were doing. Wishing you gentle rain for 2 days then more rain then more rain until you see green again. Big hugs of encouragement from NZ. Yes listening for the answer is the key to asking that question, or any question for that matter. Thinking of you guys up that way and really hoping that it rains sooner rather than later. Hugs to you. It is so nice to have friends from all the world, Chooky. Yes, we are OK, and you try to be OK, too? OK, sweetie? Hugs!!!!!!!! !